SUPPORT LOCAL CREATORS! FIND LOCAL EVENTS! NEWSLETTER EVERY SUNDAY! Keep up with nerd-related events in the Valley with the best and coincidentally only nerd-related event weekly newsletter in the Valley! We want to know what you think is cool! 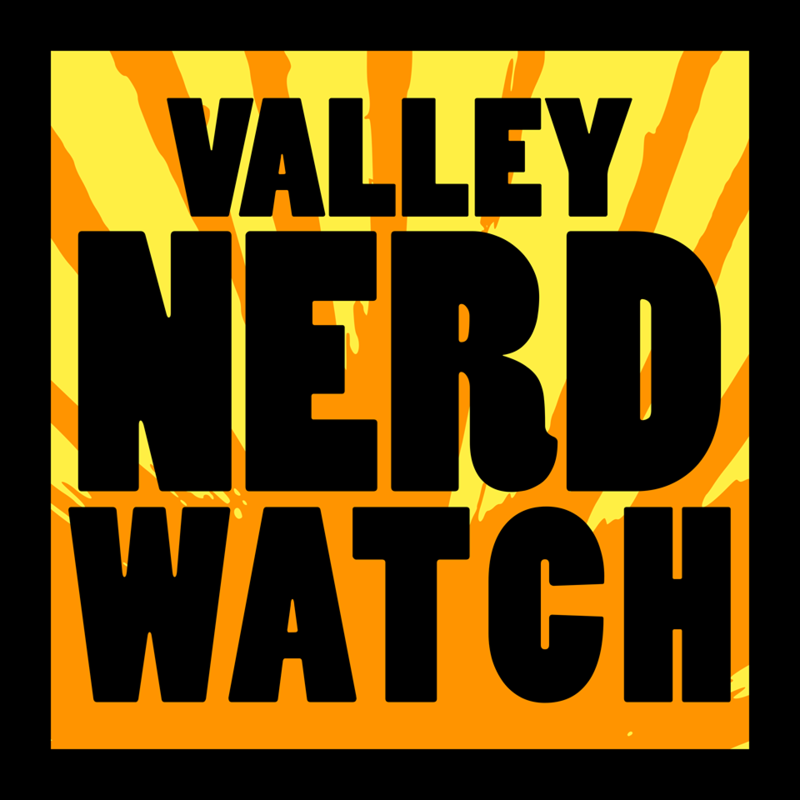 Tell us about the people, places, and things you love on twitter and facebook with #valleynerdwatch. Know about some cool local thing? Please tell us, we're jealous. We hope your week’s going well! This coming week there’s a bunch of neat stuff! We highly recommend checking out Saturday Board Games at Modern Myths, because it is always a fun time. Or Wednesday Games if you’re in Easthampton! There’s always a good game night in the Valley. Also! We have exciting news BUT we can’t talk about it just yet. Suffice to say it is related to Nerd Nite and you should all make sure to make it to the next Nerd Nite on Monday, August 14th at the World War 2 Club! It’s going to be about song mashups and weather forecasting, two great tastes that obviously taste great together! Go check out the Valley Creators page! As always, be sure to check out our Patreon and the Weekly Events page! There are a lot of fun things happening this and every week! And don’t forget to check out the updated Book Clubs List! Zines! Zines! Zines off the screens, and into the streams! Zines are a means to preen your mean … … hm. Feathers? We don’t have all day to think of ryhmes! Award-winning soprano saxophonist and composer Jane Ira Bloom presents “Wild Lines”, her new work for jazz quartet and spoken word and inspired by the poetry of Emily Dickinson. Inspired by the knowledge that Dickinson was a pianist and improviser, this explores the jazz-like quality of Dickinson’s writing! Tickets are $18 for general admission, $15 for Friends, seniors, and students! We don’t know why they’re shouting it this time but it’s still nice! It’s a great chance to see “The Villas of Oplontis” before the exhibit closes on August 13th! There will be a food truck around lunch time, hands-on art making for all ages, light refreshments, and a guided conversation about one of the objects of art on display! A delightfully mind-expanding time for all. Sara Lyons has revisited and re-photographed a bunch of the homes that the Howes Brothers documented over 100 years ago. Her contemporary portraits will be displayed alongside the original Howes Brothers images. We presume the purpose to to lord it over the past, showing off how much cooler our house are now that we have color. Eat ice cream! Play board games! There’s really not much more to say about this. We suppose the air conditioning part of things has been weirdly unnecessary for some bits of this summer, but it’s August so we’re probably going to melt as we do every year. Have a good time! Another lovely game night at the Brass Cat! Good beer, good companionship, good games. What more can a person ask for? This week they’re going to be focusing on the Highlight Game “Not Alone”! It’s about being hunted by a mysterious alien on a strange world and it sounds great! Play board games at a wonderful local store! The staff will help you set yourself up, and you’ll quickly be exploring fun new games with a whole bunch of other friendly Valley residents! There’s also always a game demo available to show you something new! Beginners welcome, ages 13+ recommended, younger folks welcome with a parent! The Necklace is a story of resentment and secrets spanning generations and all circling around a mysterious and awe-inspiring necklace from India that was left to young lawyer Nell Quincy after her great-aunt’s death! So far most of the items we’ve received from deceased relatives have been at BEST moderately cursed. The Angel of Hadley, A Legend of King Phillip’s war and the Strange History Behind It is an account of an attack on Hadley in September of 1675 by native Americans during which a stranger saved the day before vanishing. This led the settlers to believe he was an emissary of God. Edward Lodi will explain what’s up with that. Play Magic in the Booster Draft format which we are not super familiar with but it seems like you basically get a bunch of booster packs and draft a deck from them. Your $16 entry fee includes MA Sales Tax and purchases your 3 boosters, as well as adding a pack to the prize pool! Everyone who participates will ge at least one prize pack, and special promos will go to exceptional players! This is an intermediate-level event, ages 13+ recommended! Younger players allowed with an adult accompanying them! Get some quick updates about ongoing projects followed by a discussion of upcoming projects and then it’s straight to work hacking to make a difference in our local communities! If you’ve got a skill you can contribute whether that’s coding, analysis, the ability to speak to people on a phone without hyperventalitating a little, you’re welcome to help out! You can also join the Slack group at h4wm.slack.com/ signup if you’d like to chat there! Dinner and drinks are provided by the firendly Hackers! Learn about an organiation that’s helping people here and around the world live indoors! Swap plants! Bring some plants, talk to some folks who like plants, take their plants, and then give them your plants! Heck basically anything you can imagine doing with plants you can do here with these plants! Except plant them, no planting them in the library. Kids ages 10 and up, learn how to summon lighting wit ha bow and arrow, build giant rainbows, spawn farms, and modify the world… of MINECRAFT that is! Thank goodness we don’t need any more lightning-summoning children. Please pre-register at the Youth Services Desk by calling 413-283-3330. Join Mr. Vinny and Mr. Tom to play laugh sing and dance along to the fantastic fantabulous puppet band! This terror of a man has crafted a device capable of shrinking or ‘Minimizing’ entire rooms full of people! Beware, dear readers! Beware the Minimus, many have already been captured! A circus follows him, seeking to regain their forms! If you hear the subtle sound of a tiny elephant trumpetting you know it’s already too late! A special storytime designed for 3-5 year-olds that has puppets and rythm instruments! We tend to prefer arthymic instruments. Like a tambourine with a hole through it missing 3 of the jingly bits. Ring the death knell for summer and welcome the Dark Times with this summer reading wrap-up party! There’s going to be a puppet show and prizes, so definitely bring in your reading record and pick up your prize book! Wear a sparkly thing to this “Sparkle Party”! It’s a storytime! It’s an art activity! It’s sparkly as all get out! You’ll hear the story of Casey and his older sister Jessie! Casey loves trucks and blocks and puzzles as well as shimmery glittery things, but Jessie says shiny pretty things are just for girls! This story speaks to us all about freedom and respect and how to make your way in a confusing world! Command and Control sells the message of anti nuclear proliferation via the quite reasonable method of recounting a 1980 incident during which Arkansas was almost destroyed. Like, the state. Not even by any particularly wildly unlikely account. It’s almost as though hanging on to weaponry that can destroy states isn’t particularly useful OR safe! Play the old familiar, the classic, the one with dungeons and also dragons! You’ll be exploring the Dwarven fortress Stone Tooth! The adventure is recommended for characters of at least level 3. To enter, you need to get a $5 day pass, but that becomes store credit immediately! There’s going to be the first solar eclipse in North America in 38 years this month! That’s wild! Wait why do we have a memory of seeing a solar eclipse as children? That makes no sense. We were… hm. We’re really going to need to talk to mom about that rune circle she never allows us to pass through in the basement. Either way, Meg Thatcher from the Astronomy Department at Smith College will give you the low-down about what an eclipse is, why they happen, and how to view one safely! Beekeeper Kenneth Warchol will speak about the role of honeybees in the environment! Oddly enough? CTO. Bees, the collective, are the CTO of the environment. There are going to be samples of honey to taste!